The first encounter between undefeated two-division world champion Andre Ward and longtime Light-Heavyweight world champion Sergey Kovalev in November of last year had all the elements that make a great fight. Two elite level world class fighters meeting for Kovalev's unified Light-Heavyweight world championship. By now, most Boring fans know that Ward overcame a second round knockdown at the hands of Kovalev to earn a razor thin twelve round unanimous decision to hand the previously unbeaten “Knockout Artist” Kovalev his first loss as a professional to earn his second world championship in as many weight classes. The competitive nature of that fight along with what some felt was a controversial decision in Ward’s favor fueled demand for a rematch. On June 17th, the two fighters squared off for the second time in one of the sport's most anticipated fights of 2017 at the Mandalay Bay Events Center in Las Vegas, NV. In previewing the rematch this observer mentioned that much as is the case with movies that very seldom are rematches as good or even outdo the original encounter. There are times however, where much like a good movie or series of films, where the outcome of a rematch leaves more questions than answers and/or a conclusion that could best be described as a “Cliffhanger “ where there is not only debate as to what had taken place, but also what will happen next. Andre Ward-Sergey Kovalev: part 2 offered such a “Cliffhanger.” Much as was the case in the first fight, the rematch was fought at a measured and tactical pace where both fighters were able to have periods of effectiveness. Through the first three rounds, this observer found the fight to be difficult to score due largely to the pace, but I felt that the former champion Kovalev had a narrow edge due to his being able to outwork Ward and landing the more effective punches similar to the first encounter as I had him winning two of the first three rounds. As the fight progressed however, Ward as he had done in the first fight, stepped up his pace using lateral movement to set up counter punches as well as making going to Kovalev's body a key focal point of his offense. Although Kovalev was able to land some body punches of his own, it was clear in this observer's eyes that by the midway point of the bout, the tempo was being dictated by the champion. Readers may recall in previewing this fight, I stated my view that I believed that it was crucial for Kovalev turn the rematch into a fight early and needed to cut the ring off from Ward consistently in order to be successful. Kovalev was unsuccessful in doing this and the tactical errors of not being able to push Ward back as well as his inability to cut the ring off from Ward, which worked against the former champion in the first encounter remained present in the rematch. Ward’s ability to place his punches and land the more effective punches as the bout progressed became the story. Even though Kovalev threw more punches than the champion, Ward was able to frequently make him miss. Although some Boxing fans may believe that the fighter who throws more punches than their opponent should get the benefit of the doubt in narrow rounds in a close fight based on mere activity, it will more often than not boil down to who is able to land the more effective blows that will determine who will get the upper hand with regard to the scoring of a fight. In this observer's eyes, in this bout the more effective fighter was Ward. What seemed to be a fight that was evolving into a clear outcome would instead end in a scenario of a “Cliffhanger” where there were obviously more questions than answers. In the eighth round, Ward connected with a solid right hook to the head of Kovalev that staggered the former champion. Sensing he had his opponent in trouble, Ward pressed forward looking to finish Kovalev off with a series of punches to the body and the head. The champion eventually got Kovalev pressed against the ropes and landed a series of uppercuts to the body that caused Kovalev to sit on the middle rope and Referee Tony Weeks stepped in and stopped the fight. What appeared to be a clear technical knockout in favor of Ward however, quickly emerged as a controversy as video replays showed that the uppercuts that Ward had landed were in fact low blows. Although the low blows did not appear to be intentional and did appear in my eyes to be borderline, there was a legitimate cause to call the stoppage of this fight “Controversial.” It should not be overlooked that Kovalev was hit low in both the second and seventh rounds, but when he was hit low in round seven there was no break in the action and no warning from Referee Tony Weeks. There was also no warning from Weeks in round eight, but rather a judgment call by him thinking that Kovalev was hurt to stop the fight rather than issue a count seeing as Kovalev did sit on the middle rope even though he did not technically go down to the canvas. It is important to remember that referees, judges, the fighters themselves, and all of us are all human and make mistakes from time to time. Tony Weeks is rightfully regarded as one of the best referees in the entire sport and his statement following this fight should be applauded by anyone and everyone who is a fan and/or has any association or involvement in the sport. The question is will there be a third chapter in the rivalry between Andre Ward and Sergey Kovalev? Kovalev’s promoter Kathy Duva stated that she intended to file a protest of the outcome shortly after the fight with the Nevada State Athletic Commission (NSAC). Whether or not a protest will in fact change the outcome of the fight from a knockout win in favor of Ward to a no decision remains unknown over a week after the fight took place. It should not be overlooked however, that there was a fight that took place on the undercard of Ward-Kovalev II in an attempted unification of the WBA and IBO Jr. Featherweight world championships between Guillermo Rigondeaux and Moises Flores, which was originally ruled a first round knockout win in favor of WBA world champion Rigondeaux was overturned by the NSAC last week via unanimous vote due to the punch that knocked Flores down and out striking the IBO world champion after the bell had sounded ending the first round. Whether or not the result of the Ward-Kovalev rematch will be overturned remains unknown as of this writing. It is this observer’s opinion based not only on the video replays of the uppercuts that Ward landed appearing to be below the belt of Kovalev and Tony Weeks’ own acknowledgment that he missed the low blows that the result should be changed to a no contest and a third encounter between Ward and Kovalev should be ordered by the WBO, WBA, and IBF as soon as possible. Of course, each organization does have mandatory obligations where the world champion, in this case Ward, has to defend his championship against each organization’s highest-rated contender on an annual basis. This could present an obvious obstacle that could prevent a potential third encounter between Ward and Kovalev from taking place immediately. The official weigh-in for Saturday’s rematch between undefeated unified WBO/WBA/IBF Light-Heavyweight world champion Andre Ward and former champion Sergey Kovalev took place on Friday in Las Vegas, NV. The official weights for the entire card are as follows. Main Event: WBO/WBA/IBF Light-Heavyweight world championship – 12Rds. Andre Ward (Champion) 175lbs. vs. Sergey Kovalev (Challenger) 175lbs. United States Boxing Association (USBA) Middleweight championship – 10Rds. Luis Arias (Champion) 160lbs. vs. Arif Magomedov 159 3/4lbs. WBA/IBO Jr. Featherweight world championship Unification Bout – 12Rds. Guillermo Rigondeaux (WBA champion) 122lbs. vs. Moises Flores (IBO champion) 122lbs. Cedric Agnew 174 1/2lbs. vs. Dmitry Bivol 175lbs. Tramaine Williams 124 1/2lbs. vs. Chris Martin 125 3/4lbs. John Bauza 143lbs. vs. Brandon Sanudo 144lbs. Bakhram Murtazaliev 159 1/2lbs. vs. Alex Duarte 159lbs. Jonathan Steele 146lbs. vs. Enriko Gogokhia 146 1/2lbs. Fabiano Pena 166lbs. vs. Vaughn Alexander 161lbs. Zoltan Sera 170 1/2lbs. vs. Junior Younan 170 1/2lbs. Ward vs. Kovalev II takes place Tonight (Saturday, June 17th at the Mandalay Bay Events Center in Las Vegas, NV. The fight can be seen in the United States and Canada on a pay-per-view basis on HBO Pay-Per-View for $64.95 HD/$54.95 Standard Definition beginning at 9PM ET/ 6PM PT. Contact your local cable or satellite provider for ordering information. For more information about HBO Sports, HBO Pay-Per-View, and HBO Boxing please visit: www.hbo.com/boxing. In the United Kingdom and Ireland, the fight, as well as the undercard can be seen on Sky Sports 1 beginning at 2AM (Sunday, June 18th Local U.K. Time.) Check your local listings for time and channel in your area. For more information about Sky Sports please visit: www.skysports.com. Ward-Kovalev II: Will The Sequel Outdo The Original? In November of last year the Boxing world was treated to a highly anticipated battle for the unified WBO/IBF/WBA Light-Heavyweight world championship as undefeated champion and “Knockout Artist” Sergey Kovalev defended his crown against undefeated former Super-Middleweight world champion Andre Ward at the T-Mobile Arena in Las Vegas, NV. 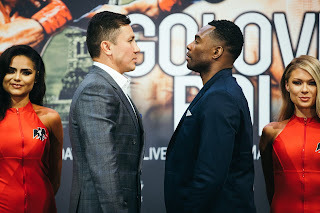 It was a rare time in the recent history of the sport that a bout described as a “Big” or “Super” fight among both Boxing fans and experts lived up to the hype that preceded it. An argument could be made that it is somewhat of a rarity in today's sport to see an encounter between two top stars that did not have a long period of time where Boxing fans had to wait to see it come to fruition while those two stars faced other opposition. It is equally rare even when the element of rematch clauses are involved to see a rematch of a fight that was regarded by many as a Fight of the Year candidate between two stars take place so soon after the original showdown. The rivalry between these two men is a rare exception. The first encounter between Andre Ward and Sergey Kovalev saw plenty of action where both fighters had periods of effectiveness. As this rematch approaches, it is crucial in my eyes that both fighters look to duplicate those moments while trying to limit their opponent from having opportunities. Readers may recall this observer’s coverage of the first encounter, where I felt Sergey Kovalev was particularly effective in the first half of the fight as he was able to apply significant pressure on Ward and limit the challenger’s lateral movement and hand speed. At the end of the bout I had arrived with a scorecard of 114-113 in favor of Kovalev, but having scored six rounds a piece in rounds. It was no surprise to see a difference of opinion as the three official judges scored the fight in favor of Ward by the same score. This was a fight that was open to interpretation as to who got the upper hand. Even though I personally felt Kovalev got the upper hand in the first half of the fight, the combat was fought at such a measured and tactical pace that there were rounds that could have gone either way depending on one's perspective as to who got the better of the action. As is the case with practically every “Close Fight”, there were some who described the outcome as “Controversial” and/or brought into question the subject of potential corruption that in their minds may have played a role in the decision. This observer was not one of those who felt there was a “Controversy “, but rather focused on the benefit this fight gave to the sport in saying that in an era where Boxing fans are asked to pay ever-increasing pay-per-view prices to see the sport's top/elite stars compete where more often than not the fights do not live up to the hype that preceded it, much less the price to see it, this was one that lived up to expectations as well as hype. With the rematch between Ward and Kovalev drawing near, what does each fighter need to do in order to be successful? How can each duplicate their success from the first encounter? For the former champion Sergey Kovalev, who will be attempting to both regain his unified world championship as well as avenge his only professional loss, it is crucial that he pressure Ward from the outset as he did in the first fight. Although he was successful for most of the first half of that fight, I felt that Kovalev made two tactical errors that ultimately worked against him. Although he was successful in pressuring Ward, Kovalev did not apply the type of pressure that pushed Ward backward toward the ropes. This along with Kovalev's inability to cut the ring off from Ward where it would have theoretically limited his movement became a disadvantage for Kovalev as the fight progressed. Despite the success he had particularly in being able to dictate a tactical pace in the first half of the first encounter, I feel Kovalev needs to show the instinct that has made his career. The instinct of a seek and destroy “Knockout Artist.” Kovalev must turn this rematch into a fight early and must cut off the ring from Ward consistently in order to be successful. In contrast to the former champion, Ward must attempt to duplicate his performance over the second half of the first fight. What worked so well for Ward after he recovered from the knockdown Kovalev was able to score in the first encounter was how he utilized his movement and timing to outbox Kovalev. Ward executed an attack to Kovalev's body in that fight that was not necessarily eye-catching, but it was able to offset Kovalev as he came forward, allowing Ward to move and avoid getting caught on the inside, but most importantly this approach allowed Ward to gradually get himself back into the fight on the scorecards after being at a deficit in the first half of the bout. Those who are fans of movies as yours truly is are probably familiar with the cliché that films that are sequels very seldom are as good or even outdo the movie that preceded it. The same holds true in regard to the sport of Boxing as there always seems to be a segment of fans who will feel disappointed as regardless of who comes out on top and regardless of what the circumstances of the outcome might be, rarely does a rematch live up to the anticipation that precedes it or the action of a first encounter. Rather than go into a long detailed point of view of the exceptions that do exist throughout the history of the sport where a second encounter lived up to the hype and in some cases led to a third or even more encounters, I will say that as the first fight was a classic scenario of a fighter known for his punching power against a pure boxer, this second encounter presents the classic scenario of circumstances, which warrant a rematch. A battle between two of Boxing’s top stars that evolved into a great fight. An encounter which produced varying opinions as to who won, and one where some pointed to an element of what they saw as a controversial decision. Two fighters, who each have something to prove. For Andre Ward, an argument can be made that he wants to avenge a victory by producing a clear a decisive win in the rematch and to hopefully in the process win over those who felt he lost the first fight. For the former champion Sergey Kovalev, the motivation is obvious. This fight represents an opportunity to not only regain his unified crown, but to also avenge the lone loss of his career and one might argue average what was seen as an injustice in the eyes of some. Whether or not the sequel to the first encounter between these two men does outdo it's predecessor remains to be seen. It is refreshing in this observer's eyes however, to see an immediate rematch to a fight that I simply said following the first encounter “Great Fight, Close Fight, Rematch Warranted.” In an era where the best interests of both the Boxing fan as well as the sport as a whole aren't always taken into consideration, this rematch should be viewed as a win prior to the two fighters doing battle for the second time. Regardless of who comes out on top this time around, it is my hope that when all is said and done that the sport, Boxing fans, and those of us who cover the sport and/or are involved with Boxing in varying capacities, who all serve as advocates for the sport as well as the fighters who compete in it, will truly be able to celebrate this win. Boxing and by extension all of combat sports are after all truly elevated and given a boost when the best interests of the fans who tirelessly support the sports both with their passion and their hard earned money as well as the best interests of the long-term benefits of the sports themselves as a whole are considered. We will see what is in store in Andre Ward-Sergey Kovalev: Chapter 2 on Saturday night. Ward vs. Kovalev II takes place tomorrow night (Saturday, June 17th) at the Mandalay Bay Events Center in Las Vegas, NV. The fight can be seen in the United States and Canada on a pay-per-view basis on HBO Pay-Per-View for $64.95 HD/$54.95 Standard Definition beginning at 9PM ET/6PM PT Contact your local cable or satellite provider for ordering information. For more information about HBO Sports, HBO Pay-Per-View, and HBO Boxing please visit: www.hbo.com/boxing. In the United Kingdom and Ireland, the fight, as well as the undercard can be seen on Sky Sports 1 beginning at 2AM (Sunday, June 18th Local U.K. Time.) Check your local listings for time and channel in your area. For more information about Sky Sports please visit: www.skysports.com. The official weigh-in for Friday night’s Boxing card promoted by Jimmy Burchfield’s CES Boxing at the Twin River Event Center in Lincoln, RI took place on Thursday. The official weights for the entire card are as follows. Greg Vendetti 152lbs. vs. Khiary Gray 154lbs. Mark DeLuca 154lbs. vs. Chris Chatman 156lbs. Kendrick Ball 163lbs. vs. Godson Noel 162lbs. Dan Biddle 224lbs. vs. Juiseppe Cusumano 235lbs. Abraham Torres 135lbs. vs. Anthony Marsalla 135lbs. Matt Doherty 138lbs. vs. Placido Hoff 136lbs. Michael Valentin 137lbs. vs. Kevin De Freitas 137lbs. Malcolm Simms 124lbs. vs, Rick Delossantos 126lbs. CES Boxing: Vendetti vs. Gray takes place Tonight (Friday, June 9th) at the Twin River Event Center in Lincoln, RI. The card can be seen on the Fite TV app and website on a pay-per-view basis for $14.99 and will be available for viewing worldwide. The Fite TV app is available on the Google Play Store as well as the Apple App Store. For more information about Fite TV and how to cast content to your TV please visit: www.fite.tv. On June 3rd WBC World Light-Heavyweight champion Adonis Stevenson climbed back into the ring with top Light-Heavyweight contender Andrzej Fonfara in a rematch of their May 2014 battle for Stevenson's Light-Heavyweight crown. The rematch between the two took place in the same venue as their first encounter the Bell Centre in Montreal, Canada. Prior to this second encounter between the two, this observer stated that it was my view that the main story of this fight would be what Andrzej Fonfara would have to offer. Although Fonfara, who lost a hard fought decision to Stevenson in their first encounter, was largely able to establish himself as a player in the division in defeat; he had suffered a brutal first round knockout loss to undefeated top contender Joe Smith Jr. two fights before his rematch with Stevenson. Despite being able to bounce back to stop former Light-Heavyweight world champion Chad Dawson earlier this year, one might argue that Dawson, who has been a cornerstone of the Light-Heavyweight division for much of the last decade, is now a fighter who's best days could well be behind him. On this basis, it was fair to ask the question of whether or not Fonfara's knockout loss at the hands of Smith was a case of a fighter having a bad night at the office or a sign of a fighter on the decline. It would not take long for that question to be answered as unlike the first encounter where despite being dominated early in the fight the challenger was able to rally late in the bout, the rematch would not see such a spirited battle. Instead, this fight would be a clear demonstration of one fighter's superiority over the other in devastating fashion. In previewing this bout, I stated that the biggest challenge for Fonfara in addition to answering the question of what he would have to offer and in the process answer those who were skeptical of his getting another opportunity to fight for a world championship a year after suffering a knockout loss would be if he could avoid the tactics that the champion Stevenson was able to implement successfully in the first fight, specifically the champion’s lateral movement and hand speed. The challenge was simply too much for Fonfara to overcome as Stevenson would quickly find a home for his left hand and score a knockdown of the challenger midway through the first round. Even though Fonfara was able to get up after being dropped as was the case in the first fight, he simply had no answer to avoid Stevenson's left hand as the combat quickly became target practice for the champion. Stevenson battered Fonfara and had the challenger in serious trouble on the ropes at the end of the first round. At this point in the fight, I was frankly surprised to see Fonfara make it out of the first round as he was unable to provide any resistance to whatever Stevenson threw at him. Sensing he had his opponent in trouble, the champion quickly picked up where he had left off at the end of round one, battering Fonfara with flush left hands to the head before the bout was promptly stopped by Fonfara's trainer Virgil Hunter early in the second round. Simply put there was not much to say about this fight. A world champion seeing his opening and taking full advantage of that opening was the story. An interesting question is what will be next for the champion Adonis Stevenson. We will likely not get the answer to that question until the outcome of the upcoming rematch between undefeated unified WBO/IBF/WBA Light-Heavyweight world champion Andre Ward and former champion Sergey Kovalev, which will take place on June 17th in Las Vegas. As readers might recall prior to the Stevenson-Fonfara rematch, I offered a brief explanation as to why Fonfara, who was rated number six in the world in the World Boxing Council (WBC) Light-Heavyweight ratings was in position to challenge for a world championship, despite his recent loss to Joe Smith Jr. in explaining how world champions are granted what are referred to as “Elective Defenses” of their championship in between making annual mandatory title defenses against a sanctioning organization's top/number one contender. Although I suggested that the possibility exists that the winner of the Stevenson-Fonfara rematch could request an extension from the WBC, which would theoretically allow that winner to seek an opportunity to further unify the World Light-Heavyweight championship against the winner of the Ward-Kovalev rematch, I believe regardless of who wins that fight that a unification bout between the two champions might not take place until sometime in 2018. This is primarily due to both the negotiating process that would be required to sign such a bout as well as the potential of injuries that might occur, which might make a fight toward the end of 2017 less likely. If one also takes into account that most fighters at the top/elite level of the sport typically average between one to two fights per year, this observer believes it may be more likely to see Stevenson make a mandatory title defense before a unification clash with the Ward-Kovalev winner can be made. Current WBC number one Light-Heavyweight contender Eleider Alvarez fresh off of a convincing victory over former WBC Light-Heavyweight world champion Jean Pascal on the undercard of the Stevenson-Fonfara rematch has built significant momentum including also scoring a knockout win over former IBF Super-Middleweight world champion Lucian Bute earlier this year appears to be ready for the opportunity to fight for the WBC Light-Heavyweight world championship that he has earned. A fight between Stevenson and Alvarez seems to be an ideal option for Stevenson should the champion want to compete once more before settling his sights on a unification clash with the winner of the Ward-Kovalev winner. Given that both Stevenson and Alvarez are both fighters with significant fan followings and have each drawn huge crowds in Canada, where both fighters reside, it would not surprise me to see a potential encounter between the two also take place in Montreal’s Bell Centre, one of the sport's more popular venues. Boxing fans and experts alike will first turn their attention to the June 17th battle between Ward and Kovalev to see how the outcome of that fight will impact not only the landscape of the division, but more specifically what impact it will have on Stevenson’s plans before any potential fights could be made. Some may also question what is next for Andrzej Fonfara coming off another devastating setback. At the end of the day, this bout had a similar look and outcome as Fonfara’s loss in June of last year to Joe Smith Jr. Although some fighters have been able to bounce back from such defeats as Fonfara has shown in the past, it was clear to this observer that perhaps Fonfara was compromised by the effects of the punishment he suffered at the hands of Smith in that he did not seem to have good reaction time once he was hit by Stevenson in this rematch. Whether or not Andrzej Fonfara will go on with his career is anyone’s guess, but when one considers the ongoing research that has taken place with regard to the effects of concussions on athletes throughout all of sports, one should wonder how many knockout losses and overall punishment a fighter can or should take as the risk of long-term damage is always present. Fonfara has always been a valiant warrior who has given it everything he has every time he’s stepped inside the ring. Whether or not this latest loss to Stevenson will signal the end of his career, Andrzej Fonfara should hold his head high because he has nothing to be ashamed of. The official weigh-in for Saturday’s WBC Light-Heavyweight world championship rematch between champion Adonis Stevenson and longtime contender Andrzej Fonfara took place earlier today in Montreal, Canada. The official weights for the entire card are as follows. Main Event: WBC Light-Heavyweight world championship – 12Rds. Adonis Stevenson (Champion) 173 1/2lbs. vs. Andrzej Fonfara 174 1/2lbs. Eleider Alvarez 174 1/2lbs. vs. Jean Pascal 174 1/2lbs. Mikael Zewski 150 3/4lbs. vs. Fernando Silva 151lbs. Dario Bredicean 167 1/4lbs. vs. Manuel Garcia 165 3/4lbs. Stevenson vs. Fonfara II takes place Tonight (Saturday, June 3rd) at the Bell Centre in Montreal, Canada. The fight is being televised in Canada on a pay-per-view basis for $69.99 HD/ $64.99 Standard definition. Contact your pay-per-view provider or visit: http://www.canalindigo.com/en/event/event-sheet/284/Stevenson-vs-Fonfara-2-and-Alvarez-vs-Pascal-LIVE for ordering information. In the United States, the fight can be seen on Showtime beginning at 9PM ET/PT and will also be available on the Showtime and Showtime Anytime apps. For more information about Showtime, Showtime Sports, and the Showtime and Showtime Anytime apps please visit:www.sho.com.